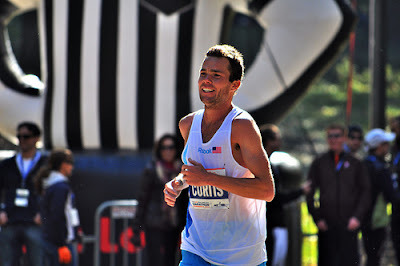 Bobby Curtis has been in the UK since Christmas, in preparation for the BUPA Great Edinburgh Cross Country meet (Curtis was named captain of Team USA, which will compete in a team format against British and European Select squads). Unfortunately, he's been niggled since mid-December by what he has termed (via Twitter) a "phantom foot injury" of unknown origin. The injury recently forced him to drop out of his planned 10K race in Balzano, Italy on New Year's Eve. He's getting treatments while in Britain, but it looks like Curtis has scratched from the race. He's been replaced on the 9-man squad by Ben Bruce, known best in the States as a steepler. It's not clear how debilitating the injury might be (at last report, Curtis is currently doing only light jogging), but European cross country courses are not very forgiving on the feet. In any event, with 2012 being an Olympic year and Curtis seemingly intent on making the USA team at 10,000 meters, discretion is currently the better part of valor. The situation is reminiscent of the last-minute injury that kept Adrian Blincoe out of the world championships' 5000 meters last year. Very frustrating for all involved.